Free yourself from email size limits and deliver large files safely! Courier integrates seamlessly with your email system to automatically zip and encrypt outgoing attachments as you work. Simply write an email, attach as many files as you need, and click Send-Courier will take care of the rest! Files still too big? Courier will automatically send them via the ZipShare web service (up to 2GB per message). Zip and email documents, spreadsheets and presentations directly from Microsoft Office 2013 applications. Whether you're working in Word, Excel, PowerPoint and Outlook, you can zip, encrypt and email without skipping a beat. Automatically zip outgoing email attachments using WinZip's world-leading file compression technology to reduce file sizes and protect your files. Are your files still too big to email? Courier will automatically upload them to one of your connected cloud services and place a in your email message. 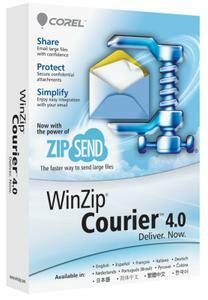 Courier works with ZipSend, the WinZip cloud service, and Box, SkyDrive, Dropbox, Google Drive, CloudMe and SugarSync. Built-in 128- or 256-bit AES encryption and password protection makes it easy for you to secure your files. Use Courier's manual or automatic options to control the encryption process. Courier also provides temporary file wiping/shredding to ensure the security of attachments shared over email. Convert files to PDF directly from your Microsoft Office apps, including Word, Excel and PowerPoint. For extra protection, you can create a read-only PDF to deter copying. Courier also lets you add watermarks to your images and PDFs to protect your work. For photos, resize high-resolution images to more convenient sharing sizes. Get a look at the contents of incoming zipped attachments without having to extract files. In the Microsoft Office preview pane, simply click on the Zip file's icon to expand a list of its contents. You can also open/edit individual files directly from this list. OS: Windows Vista, 7, 8.x, and 10.